Driving Force Helps Grad Shift Gears, Land Job Since his freshman year in college, Duwain Pinder was focused on getting a job on Wall Street. But when the financial crisis shattered that dream, he put all his energy into landing a job in management consulting. 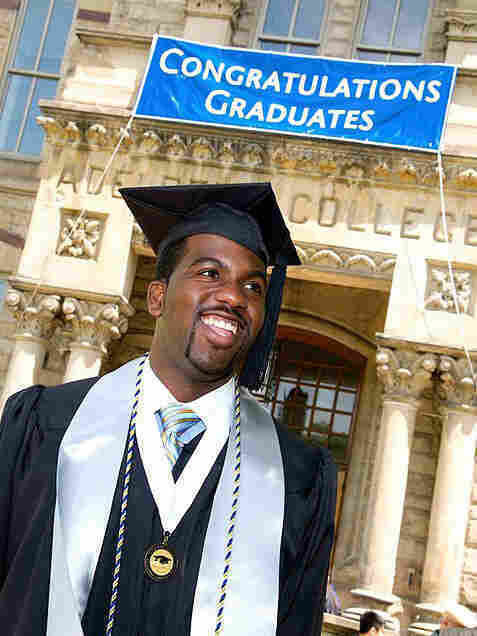 His drive helped him land a job as a business analyst for McKinsey & Co.
After graduating from Case Western Reserve University in May, 22-year-old Duwain Pinder moved back home to Reynoldsburg, Ohio, a suburb of Columbus. His mom, Dora, quickly put him to work, dealing with one of the effects the recession has had on their family: The local school district is in financial trouble, and last year's failed school levy meant the end of bus service for its high school students. So Pinder has been the family chauffeur -- shuttling his sister to and from school each day. He's also been doing errands around the house and catching up with friends and family. One thing he's not doing is looking for a job. — Job Goal: To gain the best experience to prepare for a graduate business program and a successful career. Since his freshman year in college, Pinder dreamed of being an investment banker. He fervently pursued that goal by doing internships at financial companies every summer. He also served as student body president and made the dean's list. In the fall of 2007, Pinder traveled to New York and toured Wall Street investment banks. But just a year later, the company where he hoped to work collapsed in the country's worst financial crisis since the Great Depression. "I wanted to work for Lehman Brothers. But then that kind of didn't happen," Pinder says. "It was just interesting this was a career path I wanted to go into but it's not there anymore." After talking with college advisers, Pinder decided to look at management consulting firms. He soon found out that he had to relearn how to do a job interview for a position in this field. "They'll give you a business problem and kind of go through some iterations of what you think about the problem and how you would solve it if you had the information necessary," Pinder says. "And that's something I never did before. I did a lot of practice." He spent hours and hours practicing. And the work paid off. Pinder got interviews with JP Morgan, Deloitte and McKinsey & Co. He got offers from all three. In the current job market, students have to start working toward their career goals early, says Jim Hurley, an assistant dean at the Weatherhead School of Management at Case Western Reserve. Hurley advised Pinder and other business and economics majors. "When you think about Duwain, you have to remember that he didn't start his job search in his senior year," Hurley says. "He was very career-focused when he came in to the university, and he's one of our very best and brightest, and I think his experiences and the Case Western Reserve name opened a lot of doors. But there were students that found things tougher this year." In a few weeks, Pinder will start his professional career as a business analyst at McKinsey & Co. He credits his mom for helping him stay focused on the future. Dora Pinder says there are jobs out there, but graduates looking for work have to be creative and persistent: "I tell people this all the time: Go out and volunteer. Get something on your resume. You're not doing anything anyway -- just [do] unique things to market yourself. And they will get jobs eventually."